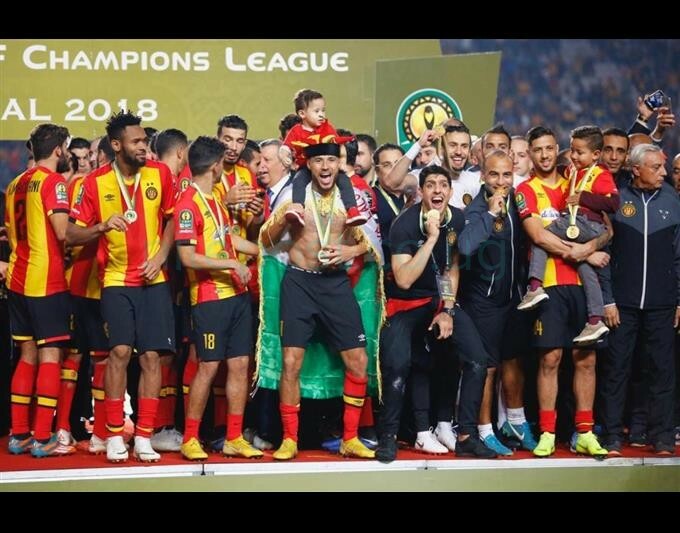 A dominant performance by Tunisian giants Esperance saw them overturn the 3-1 first leg defeat to beat Al Ahly and clinch the CAF Champions League title on Friday evening. Having won their last game against Al Ahly in 2011 and had gone 10 games without winning against the continent’s most decorated club, the Tunisian giants rose to the occasion at the Stade Olympique de Rades to rout their opponents 3 nil to lift the trophy for their third time having own it previously in 1994 and 2011. Saad Bguir was the hero of the day for Esperance when he scored in stoppage time following a dominant performance dominant on the day. The Tunisian midfielder capitalized on a defence splitting pass that allowed him strike in the far corner to beat Al Ahly goalkeeper Mohamed el Shenawy. Bguir was at it again for the ‘Blood and Gold’ in the 54th minute when he headed a Sameh Derbali cross that went past the Egyptian goalkeeper for Esperance’s second goal infront of their 60,000 fans. Esperance continued their dominance and this paid off when Anice Badri intercepted a pass and beat a host of defenders before releasing a belter that went past the Egyptian goalkeeper for the team’s third goal on the day. Badri’s 86th minute strike was enough to give Esperance a 4-3 aggregate advantage against Al Ahly who had won the first leg final game in Cairo 3-1. Esperance didn’t not only take home pride but also $2.5 million as prize money. The Tunisian giants who avenged their defeat to Al Ahly in the 2012 Caf Champions League finals will now represent Africa at the FIFA Club World Cup in the United Arab Emirates in December.